This collection of selected resources offers high-quality information about fluoridated community water. Use the tools below for further searching, or contact us for personalized assistance. Murthy VH. 2015. 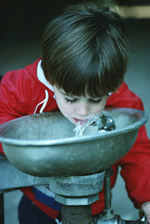 Surgeon general’s perspectives: Community water fluoridation–One of CDC’s “10 great public health achievements of the 20th century.” Public Health Reports 130(4):296–298. Centers for Disease Control and Prevention. 1999. Achievements in public health, 1900–1999: Fluoridation of drinking water to prevent dental caries. Morbidity and Mortality Weekly Report 48(41):933–940. U.S. Department of Health and Human Services Federal Panel on Community Water Fluoridation. 2015. U.S. Public Health Service recommendation for fluoride concentration in drinking water for the prevention of dental caries. Public Health Reports 130(4):318–331. Centers for Disease Control and Prevention. 2015. Community Water Fluoridation: Fluoridation Basics [webpage]. Campos-Outcalt D, Celaya M, Nunez A, Rosales C. 2012. Community Water Fluoridation: An Evidence Review. Tucson, AZ: University of Arizona, Mel and Enid Zuckerman College of Public Health. Melbye ML, Armfield JM. 2013. The dentist’s role in promoting community water fluoridation: A call for dentists and educators. Journal of the American Dental Association 144(1):65–75. Mork N, Griffen S. 2015. Perceived safety and benefit of community water fluoridation: 2009 HealthStyles survey. Journal of Public Health Dentistry 75(4):327–336. Flood S, Asplund K, Hoffman B, Nye A, Zuckerman K. 2016. Fluoride supplementation adherence and barriers in a community without water fluoridation. Academic Pediatrics [Epub ahead of print]. This toolkit for advocates provides resources for educating communities about community water fluoridation. Contents include sample blog posts, a memo for newspaper editors, letters to the editor, tips for talking to reporters, remarks to help parents and health professionals talk to city council or local board members, a resolution observing community water fluoridation's 70th anniversary, and social media messages. A user's guide is included. These posters for consumers discuss why children need fluoride, how fluoride fights cavities, the importance of water with fluoride for oral health and overall health, community water fluoridation for oral health equity, and teaching children to brush and floss. The posters are available in English and Spanish. This video explains why adding fluoride to community water systems is safe and effective at preventing tooth decay. The video features commentary from oral health professionals and pediatric health professionals about the value of community water fluoridation for children and adults. This report summarizes the Pew Charitable Trusts' efforts to support and strengthen advocacy for community water fluoridation. The report examines the impact that Pew's work has had on advancing community water fluoridation and lessons that have emerged from Pew's experiences. Examples from Pew-assisted state campaigns' efforts to initiate water fluoridation or reaffirm its value are included. This community water fluoridation plan outlines strategies for ensuring that all Iowans have access to optimally fluoridated water. Objectives and activities are discussed. A logic model setting forth long-term outcomes, short-term outcomes, activities, and inputs is included.